Contract bids are an integral part of the process of awarding either private or public contracts to qualifying companies. Companies, agencies and individuals advertise projects that they need done by posting the requirements and opening the process to bidding. Contractors who can meet the job requirements submit contract bids outlining how they propose to complete the project and at what price. After the bidding period is over, the contract is awarded to the lowest bidder. Contract bids can cover a wide array of services including construction jobs, vendors, electrical, plumbing and public projects. The biggest contract bid sectors are in federal, state and local governments where contract bidding is usually required by law. The function of a contract bid is to provide a fair contract granting process. Contract bids allow any company which can meet the requirements of the company or agency offering the contract a chance to try and land the job without having to worry about partisanship or unfair competitive practices. Contract bids also allow someone seeking a contractor to get the job done at the lowest price possible. This encourages competition, which is essential in an open market economy. In respect to state and federal contracts, the process helps to keep the awarding of contracts in the public eye and save taxpayer dollars. Contract bids are designed to meet the requirements of the three basic types of contract bid proposals. Some contract bids are sealed and others are open for revision. 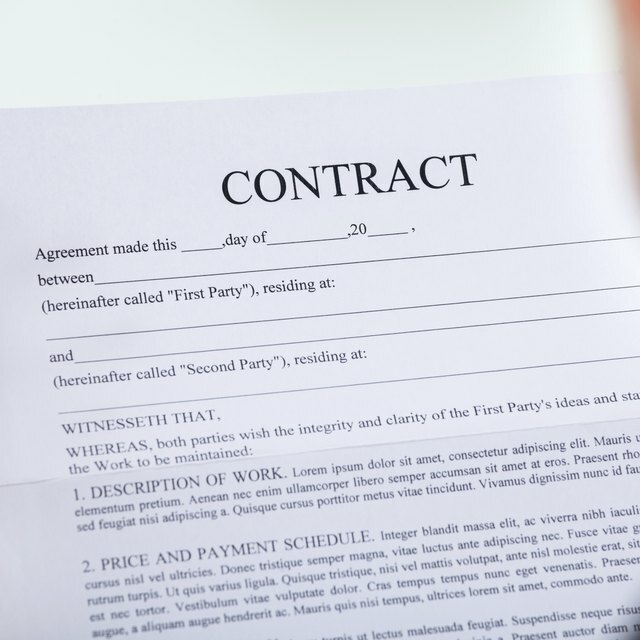 The three types of contract bids are: Invitations for Bids (IFP) are also known as sealed bids and are generally used by companies or agencies looking for supply vendors or construction services. The IFP proposal contains the contract specifications and bidders must meet these requirements in order to be eligible for consideration. These types of contract bids are sealed as soon as they submitted and cannot be changed during or after the bidding process. The lack of negotiation makes this a highly competitive form of contract bidding in which the contract holder maintains tight control over the entire process. Request for Quote (RFQ) is similar to an IFP where the contract specifications are outlined thoroughly in the proposal. However with a RFQ, contract bidders are allowed to meet with the company or agency before submitting a bid to ask questions or discuss various issues. These bids are sometimes open for revision and modification after they have been submitted. Request for Proposal (RFP) is a contract proposal that is usually used for a specialized service where it is hard for a contract holder to estimate a specific dollar amount. The company or agency offering the contract gives a general idea of the services it is looking for in its initial proposal. Contract bidders are usually required to attend pre-bid meetings where the contract requirements are discussed and further defined. The contract bidder submits a bid, which contains the specifications for the project and they set the dollar amount. RFP contract bids are often open for renegotiation during the contract process and after the contract has been awarded. Most contract bidding procedures involve a time frame that can last for a few weeks to a few months. The usual bidding procedure runs as follows: 1. The bid proposal is publicly advertised, usually either in newspapers or on a website. Proposals can be advertised for a week or up to a month. The proposal contains the contract specifications and provides instruction on how to obtain a proposal package. 2. Companies submit their contract bid proposals. Sometimes a pre-bid conference is required where the two parties can get together and discuss the contract details. 3. The bids are opened on a pre-specified date. They are read and the bid that closest meets the proposal requirements at the lowest price is awarded the contract. The winning bidder is then notified usually through a contract award letter. There are many important things that one needs to consider when putting together a contact bid. The first thing to consider is how the bidder’s company profile fits into the prospective client’s needs. For instance, most federal and state government agencies consider bids placed by companies that are owned by women or minorities before other bidders. They also take into consideration companies with large minority workforces and companies from geographical areas that have been designated economic development zones. Other things that need to be considered when placing a bid include: equipment that may have to be purchased or the deprecation value on equipment already owned, payment schedules, the cost of labor including payroll, taxes and benefits, overhead, cost of bonding and profit margin. Almost all contract bid packages are required to contain these items, usually in an itemized bid sheet. Another form included in most contract bids is an extra work and change allocation. In this form, the bidder must consider what happens if there is extra work needed to complete the project that wasn’t detailed in the original proposal. The bidder needs to layout a plan that will give a rough estimate of cost and time should such an event occur or if any last minute changes are suddenly required. In most contract bid situations the lowest bidder is awarded the contract, however coming into the bidding process for the first time, many bidders often make the mistake of under-bidding a contract proposal. This can result in the company losing money or being unable to fulfill the project requirements. Bidders must carefully consider how much the contract will cost them in terms of manpower and supplies while still factoring in a profit margin. One way to avoid under-bidding is by researching how much other companies are charging to perform similar services. In the case of government contracts, agencies are required to post past contracts, which allows companies to see how much other companies have bid on similar contracts.